I guess it is my Hawaiian upbringing, but I am a sucker for anything with mango and coconut in it. Here is an easy and delicious twist on your morning oatmeal. See my blog on oatmeal to find the perfect oatmeal for you. The great thing about using coconut milk to make your oatmeal, is that coconut milk is naturally sweet. I prefer to use BPA-free coconut milk. Aroy-D makes a great one that comes in a little 8.5 ounce milk carton, which is perfect if you are making a single serving. If you are concerned about the calories in coconut milk, feel free to dilute with water by 50% , just make sure your final volume of coconut milk and water is 2 times the measurement of your oats. Never use light coconut milk. It often has additives in it and usually doesn't have a good taste. Just dilute full strength coconut milk. It is cheaper and better tasting that way. You can use any Greek yogurt, but I prefer my homemade raw honey yogurt. 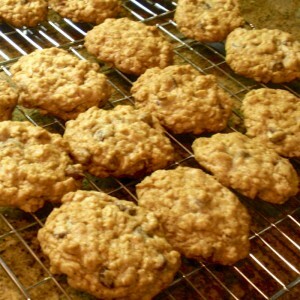 I use Bob's Red Hill gluten-free thick rolled oats, but any oatmeal, except instant oatmeal will do. Just adjust your cooking time to match the package instructions. See my post on how to cut a mango. Any leftovers can be saved for the next day. Refrigerate leftovers and pop in the microwave before serving. See my oatmeal post to learn my friend Chip's quick and easy method to make your oatmeal, even steel cut oatmeal, in the microwave. Some oatmeal is gluten free. Check the package labeling. Bring coconut milk to a boil. Add oatmeal and shredded coconut to coconut milk and reduce heat to low. Cook to oatmeal package instructions as time varies depending on type of oatmeal. 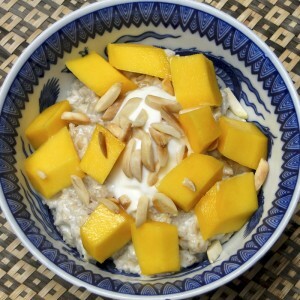 Top with a dollop of yogurt, mango and almonds.